Topped with a few handfuls of rice bran. 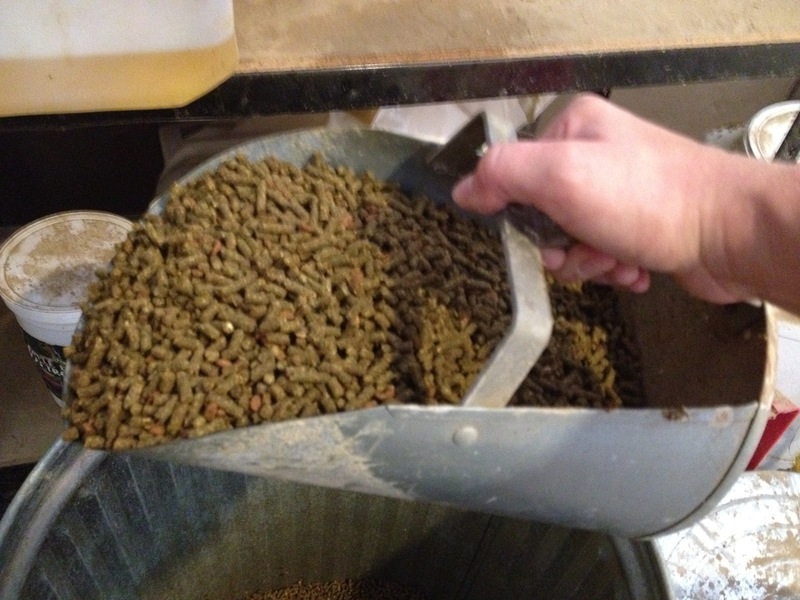 Add a scoop of senior feed. 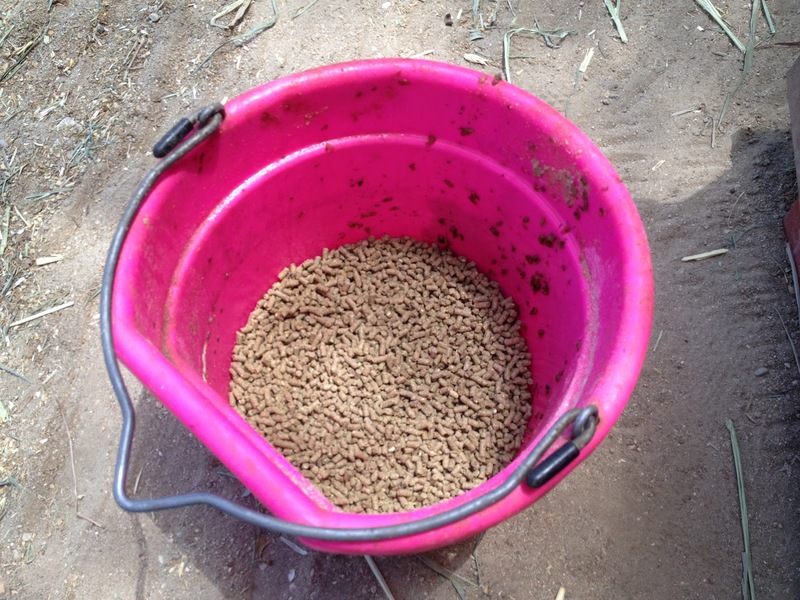 It’s full at this point, so I mix it up and dump it in his feeder. Then I continue. Next is about 5 to 6 cups of safe choice perform. 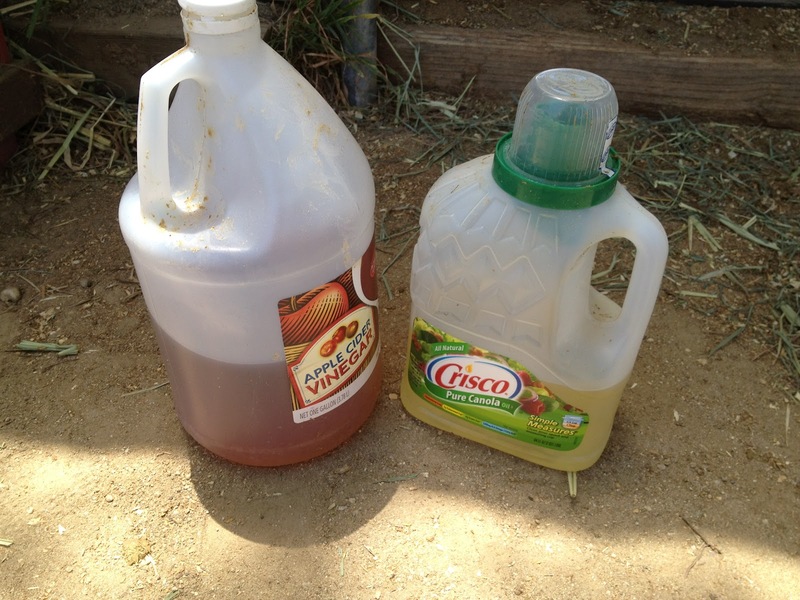 With 2/3 cup (2 cap-fuls) of canola oil and a “splash” of apple cider vinegar. Optional “toppings” include mints, carrots, and apples. 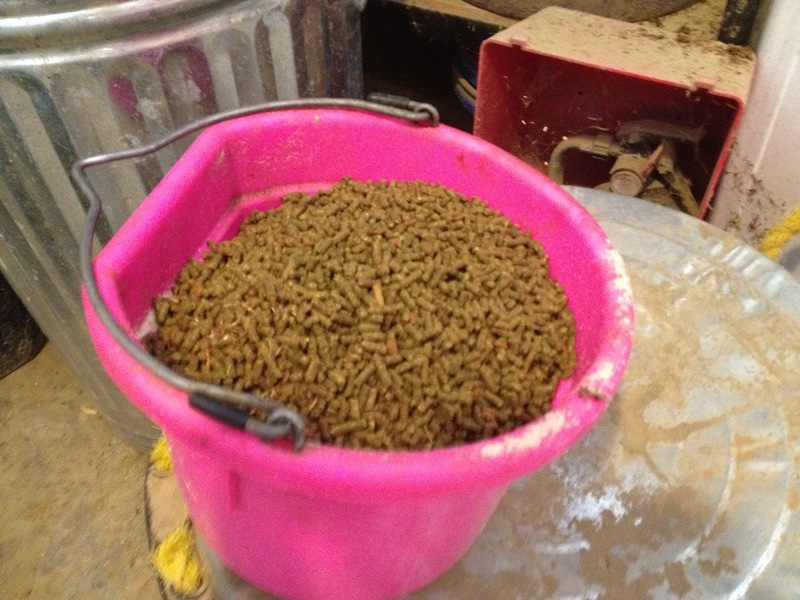 I should also note that he gets an additional helping of beet pulp several days a week, courtesy of Laurie’s assistants wanting the horses to keep the peace at feed times. On to my lessons this weekend. Saturday we were graced with the presence of Leigh Gray of Thoroughbred Rehab Center, Inc. who had picked out Bohemian for me and adopted him out to me. She was dropping off another one of the Luck horses, Pandora, at our barn, and she squealed in delight when she saw Hemie standing perfectly in the crossties, get longed like a grown-up, and stand for mounting like a gentleman. Unfortunately she left before we got to the jumping, or else I’m sure we’d have really knocked her socks off! Lesson was very good. Possibly because we had an audience of several barn-mates (Hemie is quite the ham for attention). Flat work was great – plenty of poles to keep our interest, and cavalettis at various heights. We also did our first oxer jump (2 cavalettis next to each other) and he was a great sport. We had good rhythm and didn’t really introduce anything new. 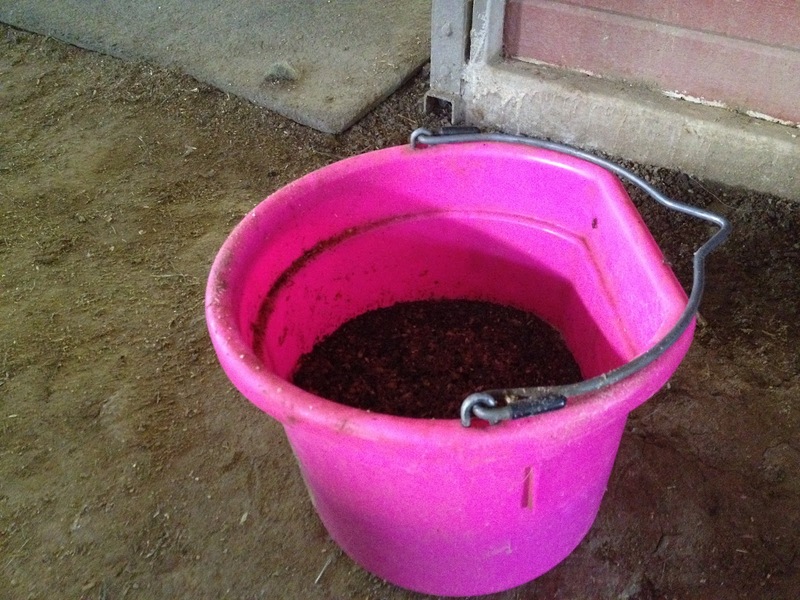 Top priority for right now is outside rein contact and straightness – no falling out. Stop caring about inside bend for now, in general. Practice rides can include a bending-right focused time – don’t do that in areas of the ring where he falls out. When he bounces his head around, keep more of a hold on him – zero “slack” or “bubbles” in the reins. When he gets fussy about it, keep telling him to march forward. Once he accepts contact and holds it for a bit, walk and release. This doesn’t need to be maintained at all times, but he needs to learn to accept contact when asked. I need to be more consistent when asking for it. As for jumping, when approaching a new-looking fence, do not use leg pressure to get him to jump over it. Even if I feel him squiggle. He’s only squggly because he’s nervous. Adding leg will make him feel pressured. Just let the refusal happen. However, when approaching a fence he is familiar with, I need to take more of a hold to influence his speed and ensure constant rhythm. Only grab mane when the jump is taking off. At some point Laurie did get on to demonstrate my level of contact (inconsistent with some bubbling) versus the needed amount of contact (wide elbows, very soft and connected, zero bubbles). Hemie got a bit stuck and resentful with Laurie – a temper tantrum, she called it. Poor guy gets confused and frustrated. But Laurie stuck through it (them, I should say – multiple meltdowns) and he really was more accepting afterwards. Sometimes retraining is a hard process, but in general I have to say I’m very proud of Hemie and enjoy his (mostly) willing attitude. I talked to Laurie about doing training rides (ie, I’d come out to watch but not ride the lesson – she’d be on him talking to me), and she said that our plan for now is going to still include me riding the lessons, but maybe have Laurie start off the ride, or hop on at parts, to help make sure he is hearing the aids correctly, but also make sure I’m learning to give them correctly. Sounds like a good plan to me. She gave me an unintended compliment by saying that I “do my homework.” Its nice that she can tell that I reflect on our lessons and try to get in enough practice rides to work on it. This blog really helps me to articulate what I’m working on. In fact, sometimes I refer back to posts before riding so I can focus on what needs to get worked on. A nice by-product. But seriously, comment on the feed. 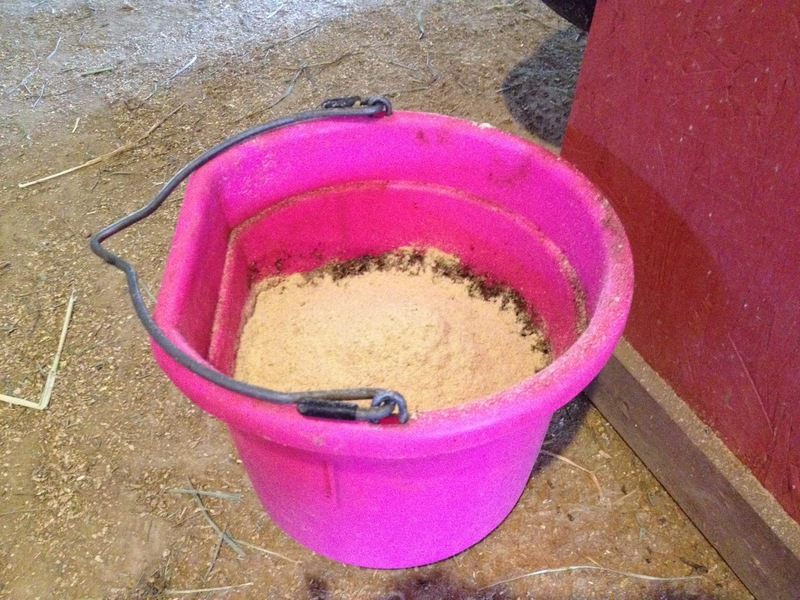 More or less that what you’d expect for an OTTB needing 150 lbs? Similar or dissimilar to your feed? Thoughts in general. Unfortunately no, my facility doesn't offer alfalfa (which is pretty strange, I know). And the logistics of me buying, transporting, and storing separate hay seems more trouble than its worth at this point.